Steak Night Monday? Steak Night Friday? 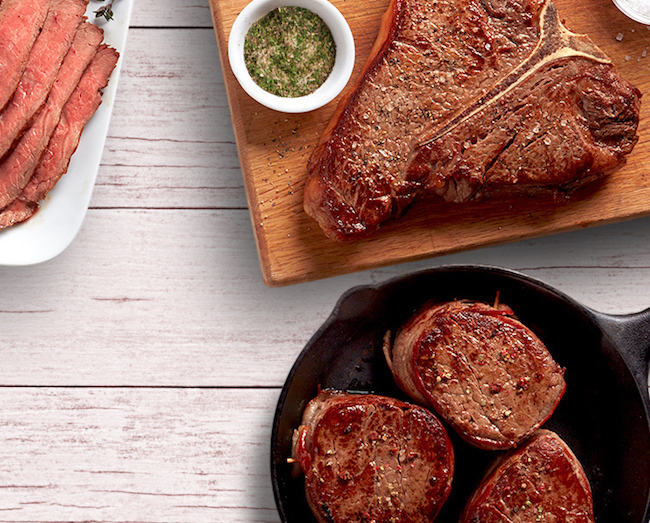 Whichever day you choose, we've got an easy steak recipe that will have you looking forward to steak night, like all week long. These 10 recipes are brand new for 2019, still sizzling from the test kitchen and ready for you to make at home. And be sure to check out our Steak Night Cooking Guide for more recipes and tips from Hy-Vee butchers, dietitians, and chefs. Oh yeah, we went there. And good news: It's not that bad for you. Splitting 1 pound of beef loin boneless sirloin steak into 4 pieces yields a serving of chicken fried steak and gravy for just 500 calories and 28 grams of protein. We'll take it. Fun fact: Marinating leaner cuts of meat like skirt steak or flat iron steak in pineapple juice helps tenderize the meat. This is thanks to a special enzyme in pineapples called bromelain. But we also happen to like the tropical flavor it adds to these sweet and savory fajitas. For a big-ish occasions and even bigger appetites, reach for the celebration-worthy rib eye steaks. Of course we love throwing these steaks on the grill, but there's something to be said for the perfect pan sear in a little olive oil and butter ... then topped with blue cheese, obviously. We named this one a breakfast skillet, but we're not sure why. It's kinda our new favorite 30-minute dinner using beef chuck boneless petite tender steaks. Flank steak is one of the leanest cuts, which means you're getting more protein than fat. So if you're trying to eat healthier, but also get dinner on the table fast (and who isn't? ), this one needs to be in your weekly rotation. It's everything you crave about bruschetta, but with tender, juicy New York Strip steak. Bonus that it's another 30-minute recipe to add to your repertoire. Fair warning, this recipe takes a little longer to prepare since it needs to simmer and stew on the stovetop for about 90 minutes. Fortunately, this is hands-free time for the multi-tasker in you. Confession time: This was immediately devoured in the test kitchen. Good thing it only takes 15 minutes to make again. This one has Italy all over it. The trick is to serve it in a shallow pool of garlic- and herb-infused olive oil, flipping it once in the oil to coat both sides with all the good bits. This is the meal you dream about before going to a steakhouse. Turns out, it's not that difficult to make at home. Our secret to perfectly seasoned oven-baked fries is to drizzle thinly sliced potatoes with basil-flavored olive oil (we used Gustare Vita) and fresh rosemary before baking.